We love pasta. Sometimes in a rediculous way. I don’t know if that makes me a carb-a-vore or a carb-a-whore, but either way, it’s one of my favorite meals to make… and eat. I especially like when the kids eat pasta because I know that the sauce sneaks in lots of great vegetables and nutrients. The problem with an elaborate dish like baked ziti is that it can take a lot more work and I don’t have time to do all the steps in time for dinner. So, I’ve figured out a way to make some of my favorite dishes using my handy dandy crock pot. Time is no longer a nuisance. Pour hot, drained pasta into crock pot. Top with spaghetti sauce, but save 1/2 c. for later. Stir until pasta is coated then add cheeses, but save 1/2 c. of mozz cheese for later. Stir until cheese is starting to melt. Top with oregano and stir through one more time. When meatballs are done, line them on top of pasta and sauce mixture. Pour remaining sauce on top of meatballs and then sprinkle with remaining cheese. Warm on low for 2 hours. Enjoy! Mix all ingredients together with your hands. If consistency isn’t wet enough to bind, add egg (I prefer mine without it). 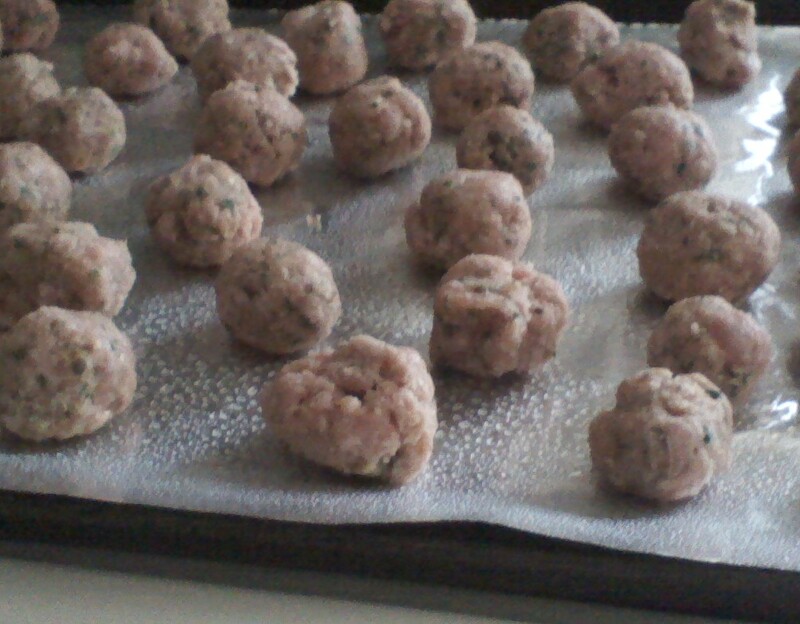 Roll meat mixture into small, bite-sized balls and place on foil covered cookie sheet. Cook in oven at 350 degrees for 25 minutes and then broil on high for 3-5 minutes to brown but NOT BURN outside of ball. When cooled, balls can be frozen and saved for later use.